Invaders about – watch out! Invasive plants – know your enemy ! There is still a lot of confusion, ignorance and just downright bad advice flying around about invasive plants but it is a subject well worth investigating, and it is fascinating to see how some plants have taken extravagant advantage of us humans and our urge to try new things from other countries in our gardens. In Mediterranean climate zones it is a particularly difficult problem and is the cause of many damaged landscapes and the loss of huge swathes of native plant habitats. Invasive exotic species are one of the principal threats to biodiversity worldwide and are estimated to cost European society more than 12 billion euros each year. The number of species involved is not stable and increases each year. To date, it is estimated that over 670 exotic plant species have been introduced into Portugal (Continental), this corresponds to approximately 18 per cent of the native flora. Nowadays about 80 of these species are considered as invasive or potentially invasive. However, most species are only found as ornamentals and in agricultural or forestry systems and do not show, so far, invasive behavior. Many commonly used garden plants fall into this latter category and are not considered a problem. Alien species have become so familiar that we can think they are native species. Often, their beauty makes us like them, and sometimes they simply pass unnoticed in the midst of so many other species. However, some of these are silent enemies that are invading ecosystems and threatening the natural species that live in the same area - these are invasive plants. We must stop their spread ! 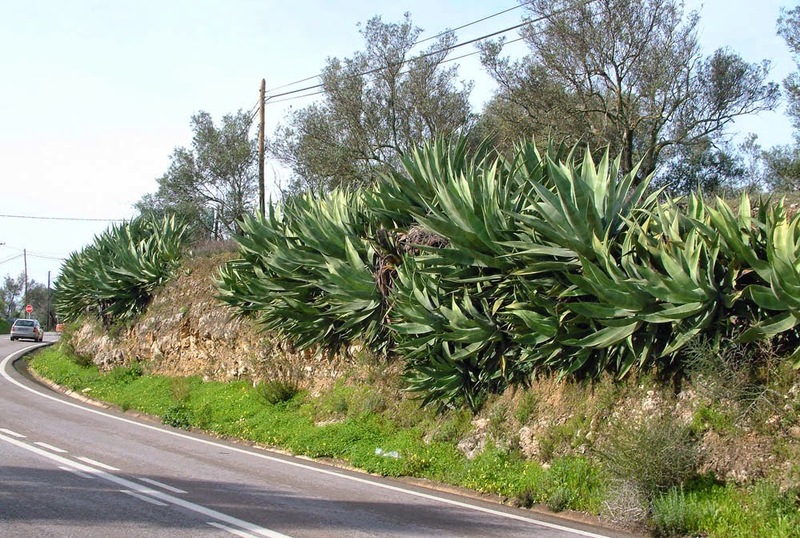 Portuguese legislation (Decreto Lei nº 565/99), enacted in 1999 so not completely up to date, lists about 400 exotic plant species as introduced to Portugal, and from these 30 are classified as invasive species. This means that it is illegal to propagate, sell commercially or use in planting schemes any of the 30 plants listed in the legislation. So, what is an invasive plant ? This is defined as a plant which has the appearance of being ‘naturalised’ but which is originally from another part of the world. 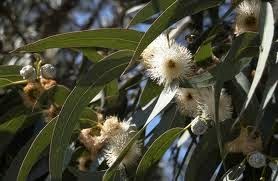 It reproduces freely in large quantities and over a wide area away from the mother plant. These plants have the potential to cover large areas, threatening other vegetation, and thereby significantly altering the existing natural ecosystems. A native plant is defined as a spontaneous, natural plant of the region it inhabits, and which lives only within the limits of the natural reproduction of the plant. Areas most at risk from invasive plants are first and foremost those of fragile natural plant communities, such as sand dunes or coastal areas. These areas are normally rich in a diversity of plants adapted to very specific conditions. Unfortunately, many protected areas are being invaded by seed borne invaders such as acacias and pampas grass – tough and durable invaders which tolerate the extreme conditions of such areas. You may already have some of these invasive plants on your land or in your garden but you may not see the damage being caused by the distribution of seed from your plants as these are carried away over a large area. If you visit the west coast of the Algarve you will see invasive clumps of pampas grass (Cortaderia selloana) along the roads and on the cliff tops. Do not go near this stuff as each leaf edge is like a razor blade ! It is extremely dangerous for children and pets. Flamethrowers will not kill it – I have heard that some people have been successful with large quantities of salt but this can poison the soil for a long time ! 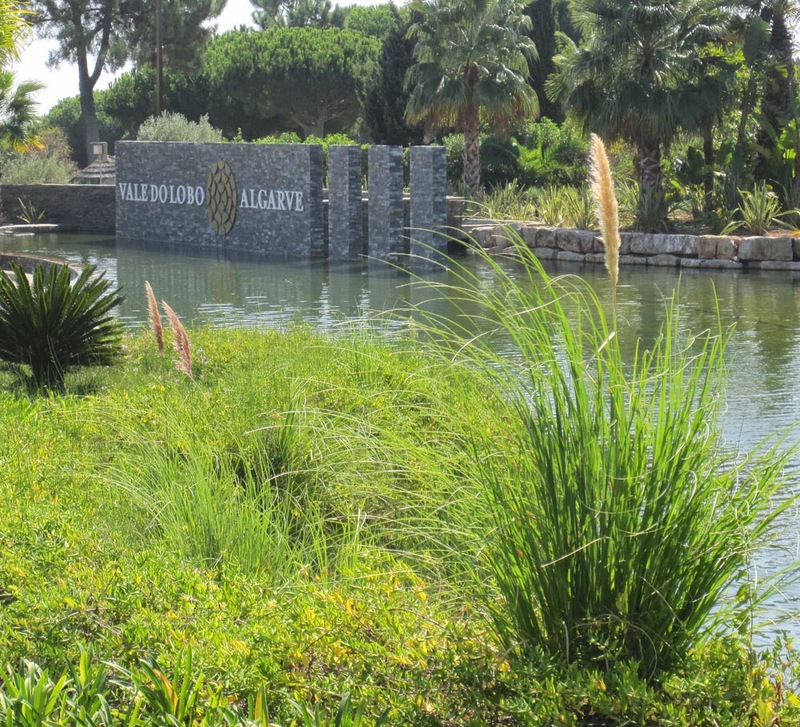 You do not need to go as far as the west coast to see poor examples of it’s use as some professional landscaping companies are using it in Quinta do Lago and Vale do Lobo in Algarve gardens and road side plantings. 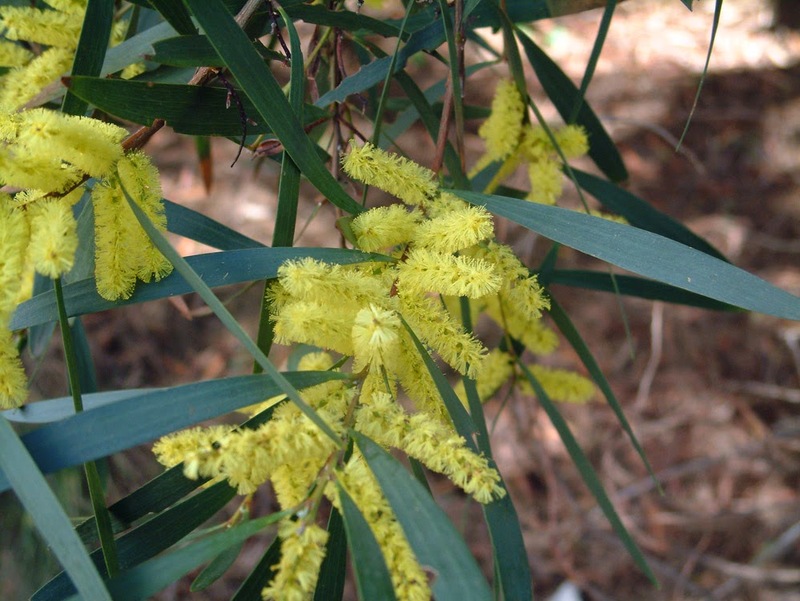 The roadsides of the lower slopes of Monchique are also plastered with Acacia dealbata (mimosa) trees, these follow the waterways and damp gullies as the seed has been borne along these routes. The landscape is covered with the yellow flowers in February/March but these trees now form a sort of monoculture which has totally smothered any other vegetation, including even the tough Arundo donax canes of the giant grass which usually inhabit such areas. This is also considered to be invasive. The team for the INVADER project from the Center for Functional Ecology at Coimbra University has recently published a Practical Guide to Identify the Invasive Plants of Portugal and this is available on request via their web site. This is part of a huge international effort to disseminate good quality information on this important issue. Biological invasion by exotic species is a process that can be seen increasingly in Portugal, and which occurs throughout the world, in utterly alarming proportions. At issue is the global biodiversity and ecosystem services that support life on our planet. And yet, the most serious problem is that we are the ones who cause the problem, often without realizing it. We must learn to identify these species, to understand what they represent, and do everything possible not to make the problem worse. 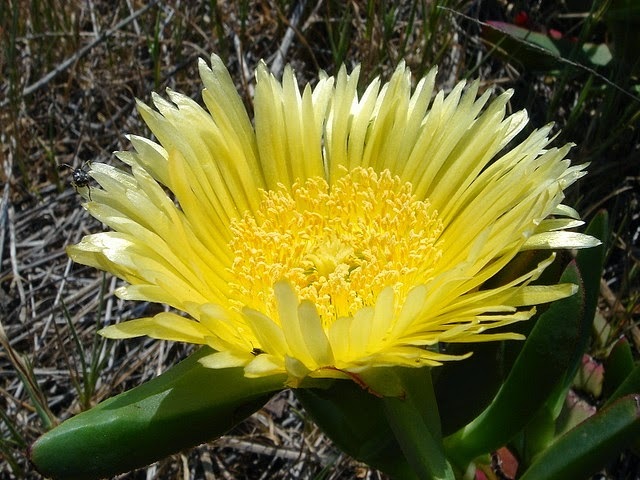 In Portugal, many of the species that behave as invasive today were introduced in times past with objectives that have long since ceased to be relevant, such as erosion control of sand dunes (eg Carpobrotus edulis or hottentot fig), stabilization of slopes and timber wood (eg Acacia dealbata) or tannin (eg Acacia mearnsii) hedges (eg Hakea salicifolia & H. sericea), food colour (eg Phytolacca americana) or simply ornamental (eg Cortaderia selloana or Pampas grass). In addition to these intentional introductions, there were others that occurred accidentally, but with equally serious consequences. The problems caused by invasive species are particularly serious because these species are a threat which can be irreversible, eg. after reproduction, dispersal and subsequent adaptation, control becomes problematic and eradication very difficult or even impossible in many cases. The Coimbra centre has developed some strategies for control and destruction of some invasive species. For instance, the best way to control Acacia dealbata is not to cut it down but to take off the outer bark layer all the way round the main tree stem for a height of about 90cm. They even organize special weekends away for keen folk to take part in these activities, and this includes gathering up and disposing of huge heaps of the dreadful Carpobrotus edulis on cliff tops. Invasive plants are one of many threats to the natural and special biodiversity of Portugal, but this is one which we can all play a part in fighting. Please take some time to familiarise yourself with the list of banned plants, look for alternatives and plant wisely for the future wellbeing of this very special part of Europe. Maybe the subject of a future article should be what you can plant instead !